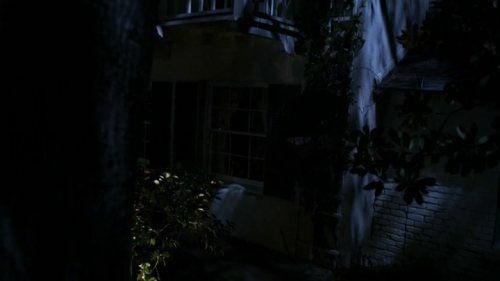 The episode opens with a woman talking about her love for someone while footage plays of a teen girl sneaking out of the house to meet the boy across the street - possibly the same one from the voiceover, but on this show I take nothing for granted. 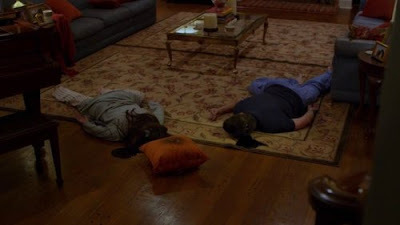 Then she returns home to discover her parents executed on the floor of the living room! And when she returned they were all on and the front door was ajar. So there's no way she's the killer - unless of course it's one of those subjective reality things, and we were watching the show from the character's point of view. I hope that isn't the case, because it always kind of feels like a cheat. Of course, they never got around to explaining how Malcolm in the middle could have possible knifed ten gangbangers to death outside of his own head, so anything goes when it comes to this show. Also, look at that picture and take a moment to be shocked by the show's extremely misguided idea of what Seattle looks like during late February/Early March. In Quantico Xander stops by Derek's office to announce that he's proposing to Garcia and wants some advice. Derek's oddly unhelpful, and walks to the conference room without shushing Xander up, even though he knows that Garcia is in the window-filled room, and will spot Xander following him like a confused puppy. Very passive-agressive, D.
Case time! There have been two couples murdered in their homes in the recent past - Garcia doesn't say when the first couple (multiracial and gay) were shot, but the prologue people were killed 'last night'. No sign of forced entry, no assault or robbery beyond the executions. It's unclear how the killer could have shot each one neatly in the head at point-blank range without any kind of restraints. At least we know the voiceover has nothing to do with the teen girl. Then something confusing happens - Greg says it's 'wheels up in 30', letting us know that they're immediately headed out to work on the case. But the very next scene is of another couple being shot to death at nighttime. Is this another killing from the night before? Did the team do nothing of consequence for the whole rest of the day after arriving in town around noon? I'm puzzled. Oh, and the killer is a blonde woman who shoots the couple with a .22 revolver while they're standing a good distance away from her in their kitchen - by no means the clean executions we were shown previously. So I guess that's just going to go unexplained. For the record, the voiceover explains that she's killing people due to her love for the titular character, one 'Tommy Brown'. So they are flying out at night after all - they get the call about the next murder while in the air, and then the writers try to plug up a plot hole and do a terrible job of it. It seems someone noticed that a single woman shouldn't have been able to execute people without tying them up or them attempting to fight back, so we get the word that 'some of the victims' were shot in the knees as a means of control. As you can see in the picture above, that clearly wasn't the case, and here's a video of the latest kill. No leg shots there, either. Also, I'm not sure why she has her gun in her right hand when seen from the front, but then a pillow when seen from behind. Especially because those gunshots weren't meaningfully silenced at all. The team observes that this is becoming a 'spree' - which differentiates it from other crimes on this show how? More importantly, according to Reid the timeline is accelerating, which means that the first set of murders did happen more than two days ago. Nice that they finally let us in on that one. Reid and Derek notice some peculiarities about the house. It's childproofed, but the couple had no children. There's also signs that the killer waited patiently in the house for the couple to arrive home, which is the kind of careful planning not normally associated with spree killers. What could be the motive? We get a glimpse into the possibilities when we see the killer desperately trying to get an address off of someone over the phone, but having no luck. After failing, she notices a pregnant woman sitting next to her, and super-creepily touches her belly while talking about how children are the greatest gift of all. Is she looking for a child that was taken away from her? Murdering potential adoptive or foster couples where her kid might have been? No, that's kind of a stretch, I'm probably reading too much into the 'childproofing' thing. JJ and Emily are interviewing the teen from the beginning, and she reveals that her parents were regulars at church functions - as were the couple from the previous night! Finally a workable connection - Reid and Joe stop by the church and discover that yes, the victims were all foster parents! Then they start extrapolating - perhaps this woman is so desperate for a child that she's going to foster family houses and searching for a baby to grab, then killing people when she doesn't find one! Which would make a lot of sense, except for that doesn't explain the lack of forced entry. Concurrent to the Reid and Joe scene we observe the killer coming up to a woman and pretending to be a social services operative, then talking her way into the home as part of an inspection. Which is a great way of explaining her presence today, but the other three couples were murdered late at night - she wouldn't have been able to talk her way inside so easily then. It's strange enough for social services to show up without calling - to do it in the middle of the night? Also, if there were no signs of forced entry, how was she waiting for that last couple? Speaking of the killer, she demands to know where 'Johnny' is, and demands information from the victim, then freaks out as the woman starts praying before her execution. The woman winds up being shot a bunch of times with no attempt at silencation. It's not clear why this doesn't draw the attention of the police. Derek and JJ are on the scene soon after, and try to figure out why their unsub is changing her M.O. here's a better question - if this woman was on the same 'emergency foster parents' list as the other three families, why hadn't she gotten a phone call from the FBI and cops outside their door the moment they learned about it? Hopefully the rest of the list is covered, and they're looking in on all the children who've recently been in care. Then Derek chooses not to answer a call from Garcia, and explains to JJ that he's not picking up because 'it's complicated'. Yes, I'm sure it is, Derek, but you don't know that she's calling about Xander. What if this is a lead? Are you seriously not taking calls from the woman who solves all your cases for you? While the team is busy giving the profile to a group of cops who - statistically - will be of no help in solving the case, the killer kidnaps a woman and announces that the victim's newly adopted son is actually the child that was stolen from her! She seems very crazy, so hopefully the team's search of mental hospitals will bear some fruit. A shockingly stupid supposition has narrowed their field of inquiry to women with access to the foster care list who either lost a baby or are suffering from postpartum depression. This is nice and all, but they're profiling the killer as someone searching for any baby to take the place of the one she lost/become the one she feels she deserves. If that were the case, she could steal a baby from anywhere - doesn't the fact that she's killing from a list of people who serves as emergency foster parents suggest that she's looking for a specific child? I'm sure they'll get there eventually. What does that have to do with anything? Also, how could that possibly be accurate? The three families we've seen killed were all murdered in residential communities - their proximity to one another was based on the fact that they all attended the same church/community center. This latest victim was grabbed while shopping, then killed close to a (presumably centrally-located) police station. Does Reid seriously not know that in the case of serial killers who are targeting specific people, the term 'comfort zone' is utterly useless? Or does he believe that Andrew Cunanan had a 'comfort zone' that spanned the entirety of the United States? More personal stuff, as Xander brings Garcia dinner, and she gets flustered trying to figure out what his behaviour means. It's all very cute. Twin videoscreens aimed at the back seat. Doesn't that seem a little premature? She just adopted a single baby a little while ago. Just think, team - if you'd checked out recent babies that went through the system you'd have known to alert this woman. Of course, that would require you being good at your jobs. The killer has arrived at a nice home, and she carries the baby up to the front door, hoping to surprise a teenager with their son! That's right, a teenager who's surprised that she wasn't in jail for another few months. Is this one of those teacher/students things? If so, ick. She tries to get him to run out of town with him, but he's nervous about the idea. Then a female friend of his shows up at the front door, so the crazy teacher pulls a piece! The woman is the kid's would-be girlfriend, who gets shot in the back for trying to call the cops on the killer. She doesn't immediately die, though, so there's a good chance this high school student will pull through! I'm confused as to why Tommy opened the door at all - couldn't he and the killer have just been quiet and waited for the other teen to leave? The team discovers that there was a woman waiting outside the doctor's office for the entire time that the latest victim had taken her child - this finally clues them in to the fact that she's looking for a specific kid. Checking into the baby's bio gives them the whole evil teacher story, but raises an important question - if the teacher was jailed two two years ago October, and gave birth to the child in prison, that would make the baby - at the very least - ten months old. How could a healthy white baby have only been recently adopted? Aren't there long waiting lists ensuring that babies like that get snapped up immediately, and don't have to get shuffled around from foster home to foster home? Why would the killer even think that A: her baby would be in one of those homes, or 2: that the parents would have the slightest idea who had adopted him? The team rushes to Tommy's house, looking for the him (and hopefully finding that shot girl) while the killer makes a speech about how love is more important that calendar years, man. The team arrives and discovers that the teen is in surprisingly good shape, but since she doesn't have any information to offer other than that the killer left with Tommy and the kid, they're suddenly without clues. Then Greg has a brilliant idea - they should find out everything they can about the killer - maybe she had other victims in the past! How is this just now occurring to you? Shouldn't you have had Garcia dredge up every piece of information there is about the killer the second you'd identified her? Garcia does, in fact, come up with the necessary information. It seems that while in prison the killer desperately tried to get in touch with 'Johnny', the first kid she'd molested. It seems she was so obsessed with him that she's even gone so far as to buy his family's old house! The very house that she and Tommy are now 'living' in! The team arrives quickly, and the killer demands to know if Tommy called them. I'm not sure why she would think that - I guess she's now just so crazy that she doesn't realize how easy she would be to track down? The killer asks Tommy to 'defend his family' and gives him the gun, so he goes outside to talk to the FBI and ask them to leave. This kid is supposedly sixteen - I can't imagine how he could be this stupid. Although the team is a little slow as well - Tommy obviously thinks that the cops are there for generic 'persecuting love' purposes, rather than catching the mass murderer that has all of Seattle freaked out. Of course, simply telling him the truth wouldn't allow them to confuse him and make him feel betrayed by informing him about the killer's other lover, so they do that instead. Tommy drops the gun and the killer goes for it, giving Greg a chance to shoot her in the back. What planet is Joe living on? Does he seriously believe that a male teacher charged with a first offense of non-violently molesting a teenaged girl would be in jail for 20 years? Isn't he supposed to be a law enforcement professional? How can he be this out of touch with sentencing? Garcia chats with Derek about Xander's plans to propose. She's nervous about getting married, and looks to Derek for support. Because his passive-agressive dickishness about the whole subject shows that he would absolutely be the right person to turn to. Then Xander shows up, and Garcia tries to explain that she's not ready to get married, but Xander plays the all-or-nothing card, and the episode ends on a cliffhanger! Nope. They stumbled around until the killer kidnapped someone she was related to. Then went to a house she was listed as the owner of. 1/10 - You know, the show ended without letting us know if the teen girl and adoptive mother were going to be okay, and what was going to happen with the baby. Classy work, Criminal Minds. Here are a few questions that went unanswered in this week's episode - and if I missed the answers, please let me know where they were. - How did the killer find the list of foster care families? - Why was the list so specific that it showed where her son had been months earlier? - How did she manage to get it (and a gun!) within hours of being released from prison - all we saw her do was fail to get information while talking on the phone? - Why would she think a foster parent who looked after her child for like a weekend months ago would know who and where he now was? - Why did that foster parent have a detailed file listing the baby's current address and plenty of information about the adoptive parents? While teachers molesting students is a depressingly common news story, this week's episode was clearly designed to evoke memories of Mary Kay Latourneau and her underaged victim, who should remain anonymous because of privacy laws, but somehow hasn't. I'm not going to mention his name, though. While Latorneau never killed anyone, the details of the case are similar enough - affair with male student, bearing him a child while in prison, them continuing contact/relationship while she was in jail. The show got a decent amount of that right. The main difference is that in the world of the show the child was 14, while Lartourneau's victim was just 12. The true story also has a much sadder ending - while in the fictional version the child molester was shot to death, the real villain spent seven years in jail and then married her victim after getting out. A heartwarming monograph about the triumph of their love over all obstacles is available from amazon.fr. I will not be providing a link to it. Why the hell were the team checking out pregnant employees of the foster care system? How did they fit the profile? And none of them showed evidence of maternal desire? How come none of those foster carers were registered, meaning Garcia couldn't find a connection? Even emergency foster carers need to be properly vetted and registered. And how could they not have been considering someone who'd had a child removed? How did that not make more sense than their crazed theory? I'm still trying to find out what happened to Johnny Lewis? Wasn't he the one she "loved" all along? Did he not reply her letters so she just stuck to this Tommy kid? Did he die? Quick question and this might be a stupid one lol why do you call Hotchner, Greg? His name on the show is Aaron and in real life is Thomas lol I'm so confused! I think they really tried to pack so much into to this. Maternal desire is a strong enough subject to have been the central theme. They could have addressed the teacher/student thing in another episode. And yeah, I was wondering why they didn't say "Tommy, she has shot seven people, and killed five." I bet he'd have dropped the gun real fast. Can't believe they glossed over true love "Johnny Lewis" and his family...where are they? Last thing, if this was a high profile case with a local teacher and a young student, why isn't she recognized?